Parking is free for people who have a disabled parking permit. The lowest P1 level of the car park near the northern entrance has 20 parking spaces marked for the disabled. The users of disabled parking must declare their vehicle registration plate number to the Messukeskus customer service point. Also the hotel parking area is free for disabled persons. All entrances and premises at Messukeskus provide easy access. All floors can be accessed by lift. Most of the restaurants at Messukeskus also provide easy access. Taxis are allowed to drive to the entrances. You can borrow a wheelchair at the entrance. If you wish to reserve a wheelchair in advance, send a message to customer.service@messukeskus.com. Please list the following in the message: the date and time of arrival, the entrance and your contact details. 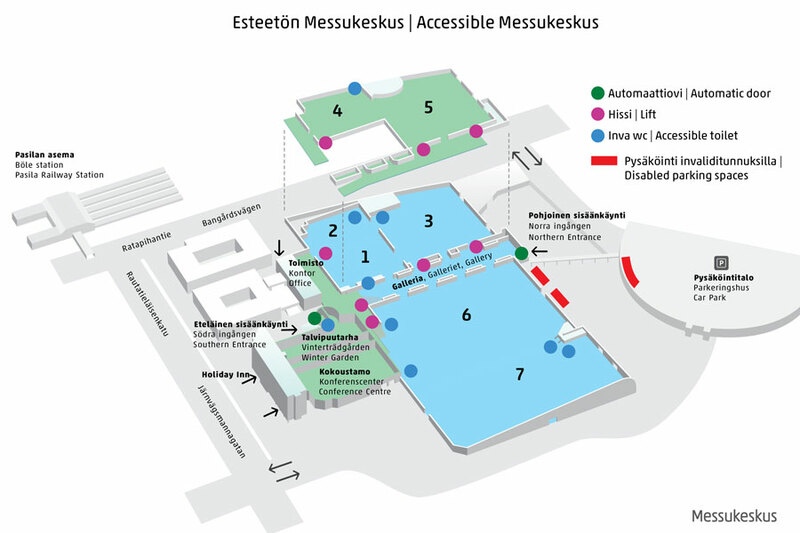 At events organised by Messukeskus, entry is free for the personal assistants of disabled persons. Guide and assistance dogs are welcome at Messukeskus. All Messukeskus floors have easy-access toilets. We work hard to provide easy access to every customer of Messukeskus. Most of all, we want to support people with disabilities to help them participate our events as easily as possible. That is why we provide special services for our customers using the EU Disability Card.